Full Name: Marshall Clinton Formby, Jr.
51st Legislature, R.S., SR 28, 2/1/1949. Resolutions - Congratulatory and Honorary. 69th Legislature, R.S., SR 15. Resolutions - Memorial. FORMBY, MARSHALL CLINTON, JR. (1911-1984). Handbook of Texas Online. United States Army, Private. "State Senator Formby Waives Deferment to Become Army Private," 5/12/1942. Dallas Morning News. World War II service, Corporal in officers' training at Fort Belvoir, Virginia, "Legislature Faces Problem of Absences: Men in Armed Forces Can't Get Leave to Attend Sessions," 1/1/1943. Dallas Morning News. United States Army Corps of Engineers, Lieutenant. "Marshall Formby Does Not Seek Re-election," Crosbyton Review, 4/28/1944, p. 1. Portal to Texas History (University of North Texas Libraries). 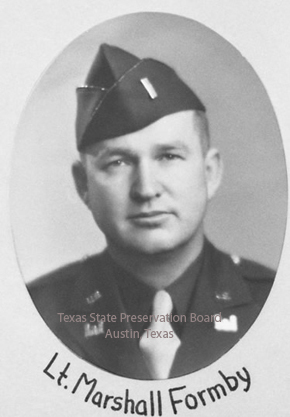 "In addition to his tireless devotion to the people of the State of Texas, his term as a state senator was interrupted by his service in World War II with the Army engineers in the European Theatre." 69th Legislature, R.S., SR 15. Resolutions - Memorial. Pictured in uniform in 48th Senate composite photo and listed as Lt. Marshall Formby. State Preservation Board. Memorial, July 1985, p. 873. Texas Bar Journal.